The Haggada you choose will make or break your Pesach Seder. A poor translation, or a book with no commentaries, will leave you with a missed opportunity. Many women go through a meal devoid of the female take on our history and heritage. The text of the Haggada has very little to say about women, except for the fact that we are still obligated in joining, since we too were saved. The Haggada I grew up with was The Family Haggada, which was adequate. It had clear instructions, good translation, but aside for that, it is not the one for me. Aside from not being Chabad (which obviously is not an issue for everyone), the commentaries are lacking. If there is a lull in the meal, you have no great reading to turn to. If someone asks a meaningful question, you have no book to rely on. It is not an expensive purchase if you need multiple, at around $3 a piece, but not the one I’ll be using this year. Again, as the average Haggada goes, it’s all about the guys. When I was in Hevron, I picked up the most beautiful Haggada I had ever laid eyes on. 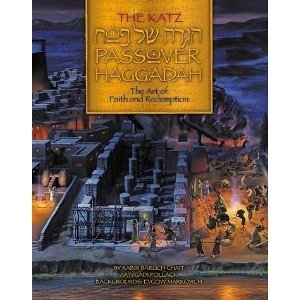 The Katz Passover Haggada illustrated by Gadi Pollack, is one that you will not regret buying. On every page is a detailed and intricate depiction of life in Egypt. It is not for young children, due to some of the sad and violent pictures. Sometimes we forget the horrors of the life of a Jew during our slavery, with this book, we are reminded. Sometimes we forget the brutality and terror of the plagues, but this book is not afraid to illustrate the might with which they were punished. One picture stuck into my mind, such a sad picture, but so telling. It is an image of a woman crying out to Hashem, after the loss of her child. The commentary says, “As a woman named Rachel and her husband were mixing mortar, she gave birth to a child. The infant fell […] The woman’s anguished screams pierced the heavens […] On that night (one year later) Hashem destroyed all the firstborn of Egypt” (Chait 107). This was the first time I had heard about the plight of a Jewish woman in Egypt. The first time hearing about the strength of our prayers. The first time I saw such loss on a woman’s face. This was also the first time that I really knew that our cries are heard. This is only one of one hundred pages. Every page has another wonder, from slavery to the crossing of the sea. Artwork has a power that words cannot always capture. The book that I will be using this year is The Slager Edition of the Haggada. With clear instructions, great translations, and very clear font, I have enjoyed reading from this book for the last three years. It is laid out like the Gutnick Chumash, with basic questions as well as deeper chassidic teachings explaining the entirety of the evening. There are a few things that I found to be very meaningful as a woman reading at the seder. During the time of our slavery, women were oppressed worse than the men in many ways. According to the Arizal, women were kept from Mikva by the police (Miller 84), the women were exposed to such a spiritual “annihilation” that it was worse than the boys’ drowning (87)! Even the more basic explanations are inspiring. Why do we keep the smaller piece of the middle Matza on the table? To remind us that if we can only see the “small piece of Matza” in our life, we should know that there is a bigger piece of the puzzle that Hashem is waiting to give us (8). One of the most ignored themes of the Haggada is loss, the loss specifically interconnected with being in Galus. Each of us has experienced our form of loss, be it a financial loss, loss of innocence, or loss of a loved one. We only have the small piece of our “Matza” in life, we all feel a piece missing, but with a strong cry that will break the doors of heaven, we can bring the peace and joy that Hashem brought us during the Exodus of Egypt.